MFC was established in 1991, starting with o-ring manufacture and pure rubber parts production. In 1995, MFC started making tools such as o rings in house. The advanced o rings can increase customer satisfactory due to tooling cost reduction, quality improvements, and product precision. The o rings usually applie to static or dynamic applications. Due to their low-cost merit, they are one of the most common sealing elements used in machine. The simplicity of its shape doesn’t lose its importance value to the machine. With the use of the o-ring, you can prevent the leakage of gas or fluids. 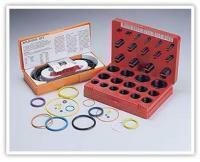 Moreover, MFC also provides o-ring kits to offer you a more convenient and practical working environment. Please do not hesitate and contact with us for our quality o ring. The o ring is the most popular and inexpensive sealing element. Although it looks simple, it is an important implement of preventing needless leakage of gas or fluids. We also would like to introduce you our practical and convenient kits. You will find that we supply kits that cone in metric, inch, and the Japanese JIS P&G standard. In addition, you also have a variety of materials to choose from. Just look through the different kits that we will be introducing to you. You will surely find one that you need. A full range of material selection: NBR, EPDM, FKM, FFKM, PA, Silicone, Fluorosilicone, PTFE, CR, and so on. Cords are produced by extrusion, and they can be made up to any desired diameters, but only good for static application.